Forget the marshmallows. It's time to really dress up the sweet potatoes for a Thanksgiving feast. A maple syrup and pecan streusel gives new life to this classic holiday side dish. While marshmallows are the traditional topping of choice for sweet potato casseroles, there is something to be said for redefining tradition on occasion. That is, if you can do so without causing mutiny at the holiday table. 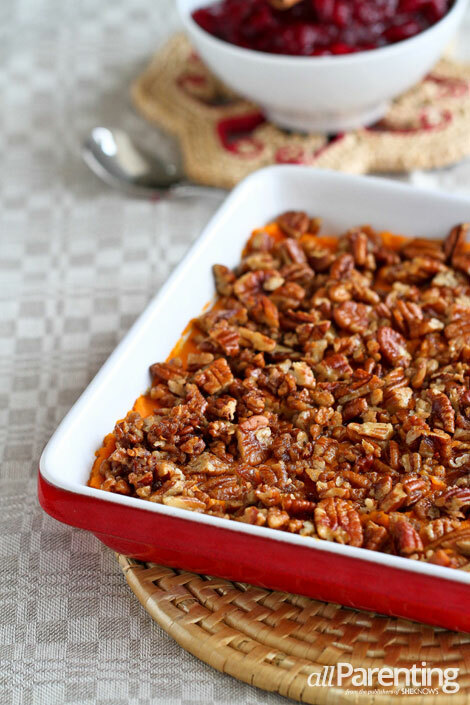 Instead of marshmallows, the creamy mashed sweet potatoes are topped with a sweet and crunchy pecan streusel, cooked with brown sugar and maple syrup. 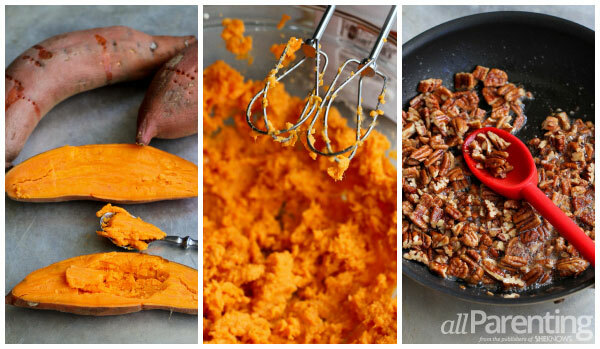 To make the sweet potatoes as smooth and creamy as possible, use a food mill or hand mixer. If you have strong arm muscles and some patience, use a traditional potato masher. Pierce each sweet potato several times. Place them on a baking sheet. Bake the sweet potatoes until tender when pierced with a fork, 1 to 1-1/4 hours. Let the potatoes rest until they are cool enough to handle. Cut in half lengthwise and scoop out the pulp. Either run the potatoes through a food mill or mash with a potato masher or hand mixer until smooth. Stir in the butter and milk until combined. Season with salt and pepper. Transfer the mashed sweet potatoes to an 8 x 8-inch baking dish. Melt butter in a large skillet set over medium heat. Add pecans, brown sugar and maple syrup to the skillet and cook, stirring, until the sugar begins to caramelize and the pecans are coated with the sauce, 4 to 5 minutes. Make sure the pecans do not burn. Spread the pecans on a baking sheet lined with parchment paper, sprinkle with salt and cool. Chop coarsely. Sprinkle the pecans over the sweet potatoes. Bake for 10 minutes. Serve.